This shoot was just featured on Ruffled! Check it out here! 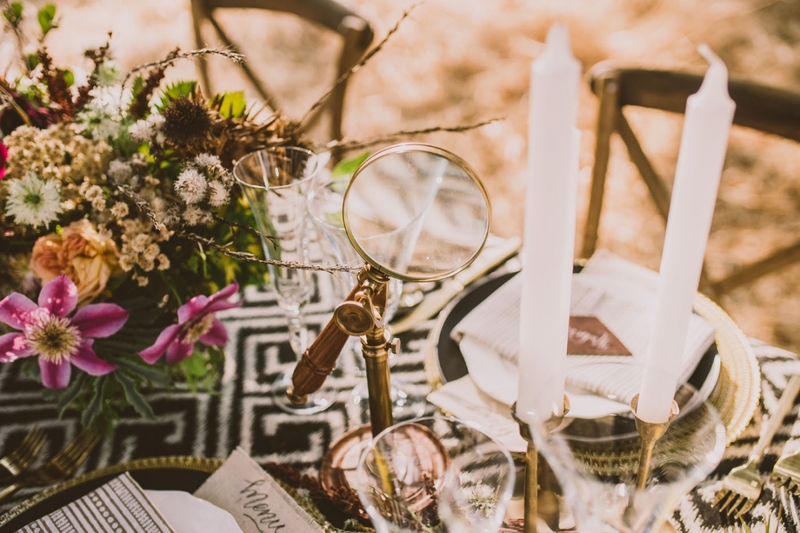 There is something so romantic about the idea of packing your vintage leather trunks and heading off with your beau to elope in some mysterious setting. Stylist Janet Tacy captured that idea of adventure and elegance inspired by the wildest of settings: the great plains of Africa. The tone is set with invitations from Salt & Stag, with details like a graphic Ikat pattern and an antique-influenced mail parcel. Their style continues to the table with leather place cards and canvas menus, which complements stunning and graphic place settings. And who can walk away from plates of food prepared by Gusto on the Go? Each dish brings color and culture to a timeless and vivid setting. And let’s not forget about dessert! Paper Cake is known for their culinary artistry and this gold-painted masterpiece did not disappoint. The bride wears an effortless lace dress with sun kissed hair in long loose curls and a stunning vintage-inspired ring from Trumpet & Horn. 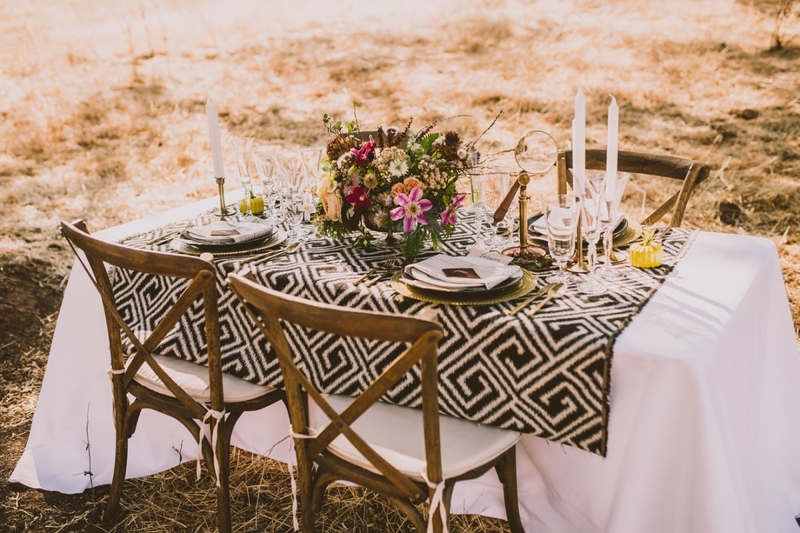 An otherwise neutral color palette is offset by the vibrant pinks and yellows found in florals on both the table and in the bouquet, courtesy of Eden Floral. What is captivating about this look are all the patterns and fabrics that work together to recreate a tieless era. A classy lounge makes for a sophisticated setting with beautiful furniture and accents acquired by Avenue Twelve Rentals. 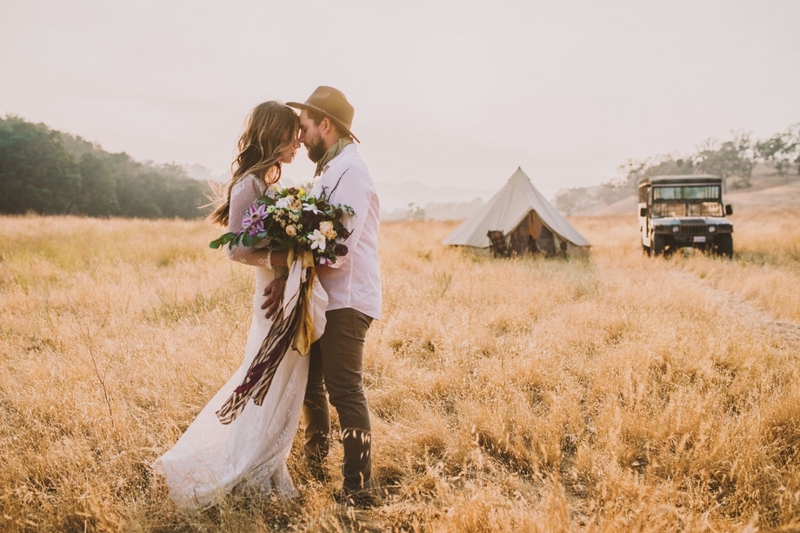 But as the sun sets on our Safari lovebirds, feast your eyes on this breathtaking backdrop, complete with heirloom props inside an authentic canvas tent we all want to own and yes, you guessed it, an authentic Jeep perfect for riding away into that golden savannah.